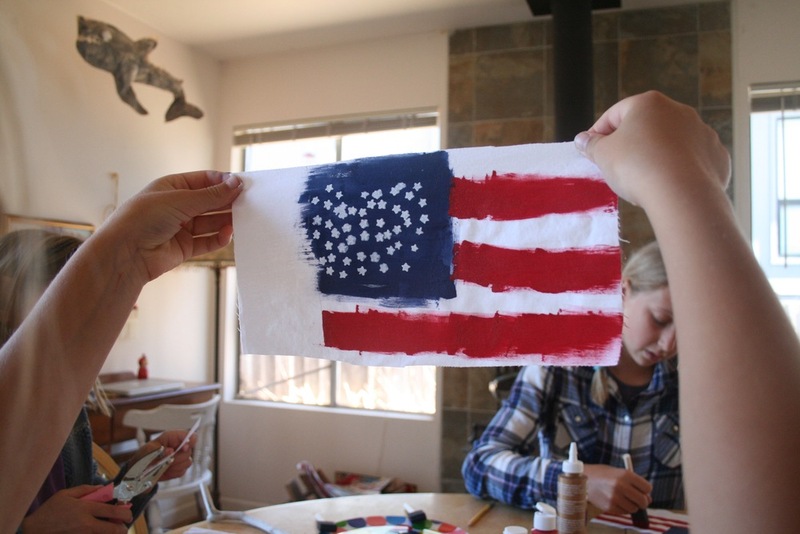 The girls just love waving American flags on the fourth of July, and this year we made our own! We invited a couple friends over, got out the paints, and made a fun afternoon of it. My first plan of action, always, when crafting with kids, is to gather my materials ahead of time. We headed to the beach to collect our flag poles, aka driftwood. We also got the acrylic paint, fabric glue, foam paintbrushes, and a star hole punch from our local craft supply shop. And then I cut some white sheets into rectangles. The girls kept the far left side of the flag white, since that will be the part that rolls around and gets glued to the driftwood. Red stripes, and a blue field to start with. Best to let this layer dry for a few minutes. Next step was to make a star stencil with the star hole punch. The girls were extra excited about the stars! Painting over the blue field with the star stencils and white paint. Make sure the blue paint is well dry before you do this step. I loved all the star patterns. No two flags were alike. Maybe not historically accurate, but who's counting. The final step was putting a line of glue on the back of the blue edge of the flag, put the driftwood on the glue, roll the fabric around the wood once and put another line of glue down to hold the fabric in place. And then forever wave your banner high!